More and more the World Wide Web emerges as a playground for our main visual and audio senses. Therefore we implement in almost all website projects multimedia elements, like slide-shows, photo galleries, animations, sound and video. It definitely supports your message to your audiences. Hence we are happy to offer you our animation, sound and video editing services which will make a difference to your visitors. A variation of simple to complex Flash animation and development projects with implementations of Action Script 2 or 3 which were created since 2008. After examine the examples below just contact us for a free quote. One requirement for the final NZQA level 7 Bachelor of Computing Systems Project was to create a Flash animation which is incorporating their colour scheme and overall message. It is based on the AS3 greensock framework. This was from concept to finish my work. First I had to develop a design concept, including phrase, star and picture animation. Then I would need to find and customise the required scripts, so I had to deepen my knowledge about AS3 and greensock framework in particular, incorporating external files via XML. This is an offline team project presentation for the Department of Computing at Unitec, which was selected as the best solution of that semester. This final NZQA level 7 Multimedia course project is based on Flash AS3. The multimedia application was styled like a website to present the comprehensive information using different navigation elements with a slide show and video playback area. I got again the team and also the technical lead role due to my experiences with Flash. So I was mainly responsible for the technical implementation and configuration of navigation, content, slide shows, videos, background music and graphics. I also created an fly-in animation based on 117 Google Earth screenshots and also cut and implemented the videos. My Partners were responsible for finding suitable content, music, pictures and graphics, creating the logo and slide shows, and writing the documentation. 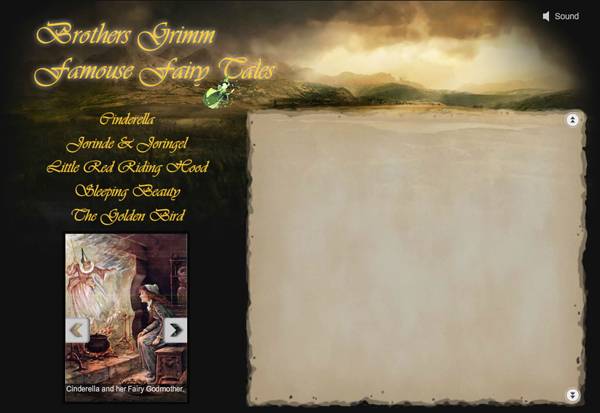 This project was about creating a multimedia application for kids to show fairy tales. It is a show case of my skills as a Flash Developer based on AS3 in a NZQA level 6 Multimedia course. Most of the required skills I had acquired from former training at Natcoll and self-studies into the greensock AS3 framework. It has an intro animation, a slide show, animated navigation and background music and other sound elements. The background picture was taken from a website. This was a team assignment consisting of two fellow students and myself in a NZQA level 6 Multimedia course at Unitec. The task was to create a multimedia website in Flash containing sound, animation and video elements. We choose the fitness area and looked for suitable templates (flashmo.com) to tweak for our requirements. Since I had already worked with Flash AS3 at Natcoll I was mainly responsible for the technical implementation and configuration of content, slide show, videos, background music and graphics. My Partners were responsible for finding suitable texts, music, videos, pictures and graphics. This was my final class project to show case what I have learned in Flash CS3 web development. It is based on Action Script 3. It has animated header and navigation elements, a slide show, a dynamic text area and a video incorporated, making this a real Web 2.0 experience.